Jane and Nell went to see Sam today. They were able to take him out for lunch though he found it hard to converse. It was as if there was so much going on in his head he found it difficult to concentrate on anything else. He quickly wolfed down a big plate of steak and chips. Nell popped out for a minute. When she came back Sam said he was relieved. "I thought you had been killed," he said. "There have been warning messages on the television." So he is clearly getting psychotic again. We had thought the medication might have been kicking in now. When they took him back to the ward although staff were friendly and polite nobody seemed interested in how the leave had gone or what Sam might have been saying. They seem to monitor his state purely by his behaviour. Driving home yesterday Jane and I knew it was not the right place for Sam. I guess we'd known it for a while. There's support for this view from Sam's social worker and from the commissioner who has agreed the money to pay for it. However a hasty change could be moving from the frying pan into the fire. We need to take a measured approach and look for other places that can clearly provide what Sam's current place can't. They weren't interested in budging on their "plan". We'd heard three different versions of the treatment plan over the last couple of weeks and then been given the original plan again. If they don't know what they are doing how are we supposed to? Jane is, by coincidence, going to a meeting at another well regarded private hospital soon. Her friend has asked to look round while she's there so Jane is joining her. Sam's social worker and another friend have also expressed interest. We'd looked at details of this place with interest some time ago and a reader of this journal visited recently and was very positive. Today was the day to see the consultant. I've been not too well this last week. Lots of my ME symptoms coming to the fore. I'm sure it was the anticipation of today's meeting. I woke this morning feeling dizzy and aching. I thought, "Am I going to be able to even go today?" Then there was a loud knock on the door. I'd asked him to come earlier so that he didn't delay us in setting off for the meeting. But not this early. Jane had been up half the night and was now back in bed again comatose. I pulled on a pair of jeans and tried to rush downstairs, open the door and appear polite. When he finished I went back to bed for a bit while Jane got up. Recently Sam always seems to be better or worse than expected when we attend for a meting. We arrived and Sam was found - in bed. He joined us and we tried to chat. At first he was very quiet but after a little while he started talking. He was troubled, worried, upset, not totally rational - bus showed no signs of any strong psychosis. He began to talk about how he saw his current life. He had been up all night reading the notes prepared for his tribunal. He tried and succeeded in straightening out his thoughts - but he could not elaborate. He said that he and the other patients were just toys being pushed around by the doctors in a game. I found it hard to disagree. He started to talk about his discussion with the doctor this morning and a very emotional incident in his life a year or sop before he became seriously ill. It all became confused. I wasn't sure if he was talking about the doctor or the incident. I don't think he did either. I was called away before we could resolve it. It was time for the meeting. The doctors were waiting. Please could we go in? We rushed into the room, thinking we were late and the were waiting for us. Please could we wait next door. They weren't quite ready yet. Some "housekeeping" - ie tactics and talking about us no doubt. We waited in a cupboard next door for fifteen minutes before we were invited in. Well at least the consultant was. Nobody else got much of a word in. Informative - yes. Considerate - yes. The body language was right he asked us for our views and questions. He tried to answer them as best he could. Patronising - yes. Empathetic - no. He didn't really show any understanding of where we were coming from. This was not a meeting to take our knowledge and view into account. It was a meeting to try to assuage our concerns. When he said to Jane, "Just trust me," I thought she was going to cross the room to throttle him. I started inarticulate and struggling for words. As it went on I improved and became more confident but left feeling drained. Jane managed to control her emotions during the meeting but managed to put her points assertively. This left her drained also. Who then was going to drive home??? Okay - I did, and we got home safely after driving through some lovely autumn early evening sunshine despite the weather forecast for rain. We took the scenic route avoiding rush hour traffic and arrived home feeling a little better. Nell insisted on making us a lovely meal on our return. We sometimes feel we don't deserve her - but it's nice that she feels that we do. Jane and I both shed some tears today. For those of you who don't know him he is a radio broadcaster and disc jockey who has had a huge impact on the British music scene over the last thirty five years. Lots of the rock and pop music that we know so well would not be played today if he hadn't introduced it to us. Our emotions are very close to the surface at the moment because of ongoing events with Sam so when we heard the news we both became upset. When Nell came home from work she had also heard the news. I was surprised at how upset she was also. Clearly John had crossed the generation gap. The only other time we can remember feeling like this about a media person was when John Lennon was killed. We're going to see the consultant and the doctor in a couple of days. I think I've been worried about it for some time. Maybe that's why I've been feeling so poorly for the last few days. It's not just being worried about discussing with the consultant. It's also to do with doing it with Jane. We have a different approach. A different attitude. I'm not saying one is right or wrong. It's just different. I know that Jane's approach causes me stress. I'd sooner go on my own rather than feel I'm kind of manipulating (does that sound awful?) what she says as well as trying to get my points over to the doctors. I still have a need to control such meetings. I thought I'd given that up. I no longer had the strength. I'd passed the responsibility to Jane and sat back. Maybe it's positive that I'm trying to get more involved again. But if it causes stress and disharmony then maybe it's not so good. The meeting I'd asked to attend was last week. But Jane couldn't go so they rang back to rearrange it when she can. They are clear they need to talk with her as they see her as the one who is taking serious issue with what is going on. I understood and could interpret it in a positive as well as a negative way. But they are right. Jane doesn't want to hear the outcome of the meeting from me, she wants to be in the decision making process herself. Anyway they will have had their meeting last week so we are no longer part of that. It is now a special meeting for us. Again we are not represented at the professionals meeting but will have another that could then so easily become a confrontation - especially if they get it wrong with Jane. I no longer want to go. I'm aching in my muscles and bones as I write this. I just want to walk away again. I've been rather pretty tired again the last few days - a rather depressing resurgence of my ME symptoms. Despite that I still managed t get up today in time to go to a training session that Jane was doing as a carer for the local Social Services. I'd said I would take some photographs. We'd thought of doing a website where she could advertise her willingness to offer training and support sessions to mental health professionals regarding issues to do with carers. There is an intent to involve carers more in training - including that for psychiatrists but we've seen only a few signs of this so far. Jane's other part time work seems to have dried up for the moment but she now has less enthusiasm for it anyway. Whereas she is really enjoying training sessions like today and the various committees that she is on. So if she could get some more paid work in this area that would be great. I managed to get out of bed and to the training venue only a bit later than I had promised Jane. They had just started the second session after coffee and I managed to get some good photos using natural light rather than flash so as not to be too intrusive. Jane of course hated the ones of her!!! And why was her hair such a mess? Looked okay to me - but then I'm a man! I'm not sure even my photoshop skills will be able to turn it into the neatly brushed head of hair that she imagined she had! I've got into writing a post on this blog and then saving it. This means I tend to be about a fortnight behind. The trouble is I think sometimes I publish something when I should have saved it and everything gets all out of sequence. Look - you're all more expert on this blog than me. I rarely read it - I just write it. I was going to ask you to help me out with what name I might have used for "Zoe" before. Because I thought you might remember it better than me. I'm afraid my short term memory is pretty poor at the moment. We've just received an invite to "Brian and Sheila's" retirement party. I used to work with a 'Brian' and could vaguely think of a connection with a 'Sheila' and the address for replies was close to where a good common friend has recently moved. But it turns out it's not them at all. Look - if anyone out there knows of a Brian and Sheila who are retiring soon please drop me a line. I'm so embarrassed about this. We were both keen to see Sam today but almost couldn't make it. Jane's had a bad back for a couple of days. It followed on from a bad cold - so I don't know if there's a connection. But Jane tends to get illnesses when she is down. I've been feeling off colour again for a while. Last night I was exhausted. On awaking and trying to get up this morning I ended up going back to bed for a couple of hours. Eventually we decided between us that we could make the drive there and back to see Sam. That went okay (once we had checked with the ward and been told to arrive after 3.00 as they were having a security check between 2.00 and 3.00.) Maybe a drugs bust? There was a new poster up in the entrance hall advising visitors that supply of illegal substances would be reported to the police. Sam was asleep when we arrived but we went out for a stroll round the grounds with him. The fact that this was okayed shows they think he is getting better. He was quiet but shared few thoughts that one could describe as psychotic. He seemed as well as we've seen him for a while. ... well one turned into two and then a take-away curry on the way home. A message from Sam's care co-ordinator. We'd written to him about recent events to keep him up to date. It seems that the psychologist from Assertive Outreach has visited and was very concerned about Sam's state. They intend to write and ask about the need for provision of more non-medical, theraputic interventions. Just hope the hospital doesn't think we've set them up to it!!! Jane hadn't been well since we got back from Venice with all the stuff about Sam. She's hardly slept. She came back from seeing Sam so much more positive. She's been able to converse with Sam. Okay, he's not well - but it really was an improvement. She was feeling positive again. The next day another phone call from the ward doctor. Could we come to the meeting? And Sam was so much better. What a change in tune. Jane couldne't make the date but said I would go. Then we got another phone call. It would be better if Jane could be there too. They're frightened of her and know they have to speak direct. That's good. But they can't understand that she may have other things arraged - such as a training session for ASWs - that cannot suddenly be cancelled at a moments notice. Because we are concerned we are assumed to be at their beck and call. Earlier today the father of a son with schizophrenia (not me) was interviewed on the radio. It was the John Peel programme, "Home Truths", on BBC radio 4. It is repeated on Monday evening but you can also listen to it or find a link to a transcript here. The programme has a messageboard but nobody seems to have commented on this item yet. The day after we got home from Venice Jane rang the ward. She spoke with the ward manger who was friendly and helpful and expressed her own concerns that Sam was still so poorly. Jane asked about the medication and the ward manager went off to find out. A few minutes later Jane found herself talking to the ward doctor. She was curt and the conversation suddenly had another tone. The treatment plan she described was different from what had been described to us by the second opinion consultant. How and why could it be so different. Suddenly we were totally confused again. The second opinion consultant was only there to agree to the addition of the tranquiliser, Jane was told. The other medication had already been agreed. This all sounded so different from the conversation I'd had with the consultant when I was on the water bus in Venice. How could it be so different? Where had the communications broken down? The doctor was unsympathetic to Jane as she tried to describe her concerns. Why didn't we just trust them to get on with it and stop worrying, she asked. Didn't we realise that the new medication was just trial and error? It was a "game". There was a meeting next week when the treatment plan would be confirmed. It wasn't clear what has been decided and we were just totally confused. This made Jane so upset and angry. The doctor backtracked straight away. Of course she hadn't meant it was a "game". She hoped Jane wouldn't take that comment out of context. It all calmed down and at the end of the phone call Jane and I tried to begin to make sense of it all. We had thought we understood the treatment plan but now it was all in the air again. It was the doctor again. First she talked to Jane then Jane passed her on to me. She seemed to be trying to make amends - or maybe someone had said to her "don't mess with them" and she was worried about some of the comments she had made. She talked again about the meeting next week. It wasn't just about Sam but about the whole situation including parents needs. "In that case," I asked, "shouldn't we be invited?" To be fair she was trying so hard to be sympathetic. She was talking of how she understood how hard it must be for "you guys". She went on and on about how sympathetic she was, about how she had found it so hard when she fist started working not to get emotionally involved but now she had got over that. Obviously until we come along and make it all personal again. We shouldn't be having to teach them it. I'm anxious about the meeting with the consultant tomorrow. Maybe its the delay. It's kind of blown it up into something more important now. I can't do confrontation any more. I used to thrive on it. Now I just quiver and shake and get upset. I've always wanted to go to Venice. We've joked about it - we've been to lots of other European cities for short breaks but why not Venice? Friends have joined in the joke - buying me guidebooks and so on. Well, guess what? - We got some cheap flights and a hotel for a few nights in Venice! The first evening was great. A beautiful sunset as we looked out of the bedroom window over the canal. We had a drink and a meal and back to the hotel. The next day we strolled to the vaparetto stop to get the water bus down the grand canal to St Marks. I had my camera and managed to get to the front of the boat to take photographs. As we came to close to the Piazza san Marco my camera finger was getting ready to work overtime. "Hello, this is Dr Harrison. "I'm ringing from the hospital. "I'm here from the Mental Health Commision to do a second opinion report on Sam for a Section 39 report as he is not capable of consenting to his medication." We had been told this was going to happen. I just wasn't expecting a phone call about it just as I was about to enter the part of Europe I had been wanting to visit for years and years. He explained carefully his role, the medication Sam was on and his opinion of it. He described the treatement plan and how he felt that fitted in with his experience of other patients and other doctors. He was kind and reassuring. As we talked I tried to take the occasional photograph from the front of the waterbus. After all I might never visit here ever again and I was struggling to appreciate the beauty of the view and the information about medication all at the same time. "Why can't I speak to him?" He explained the treatment plan for the medication in a clear way that nobody on the ward had tried to do before. It conflicted slightly with what we had understood but was more reassuring. As I was getting off the waterbus we came to the end of our conversation. The bells started to ring at noon in the Campanile. Dr Harrison heard them over the phone and asked where I was. There always seems to be something that goes wrong when we are on holiday. Although the content of the call was helpful the timing was awful. Jane and I both feared something awful when I received the phonecall from a doctor at the hospital. There was lots that Jane wanted to take issue with the doctor. For instance he said we were the only the second carers he had called in five years because others were not interested. We may be some of the few who are still prepeared to face up to the consultants. Jane was upset she hadn't spoked with him though. She needed to get out her frustrations and upstet. But I had taken that role today. I was cross too, not to be trusted with that role. Too often I've found it easier to let that pass to Jane as I haven't had the strength. We stood looking at the views across the Grand canal distorted by the tears in our eyes. We went to Florian in St Marks Square for lunch. 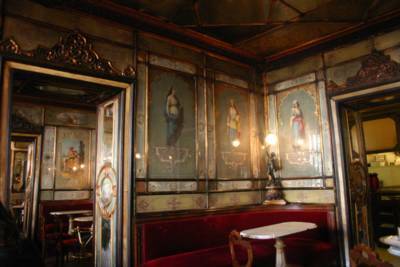 "This historic cafe has been tucked away under the arcades of San Marco since 1720. To Balzac Florian was a 'reading room, a theatre foyer, a confessional, a stock exchange and a club.' It is sumptuous and expensive, but unmissabble." We had a couple of beers and delicious sandwiches seved on a silver tray. We took photographs of a couple of young Japanese women and they took photos of us. A quartet started paying outside the window. We talked, cried a bit more, and began to unwind. After all, we were in the "finest drawing room in Europe", which was how Nepoleon described the Piazza. Maybe sometime we'll have a holiday without a phone call about Sam. I went to see Sam yesterday. A couple of accidents on the motorway. One I saw and the other had only just happened. I drove carefully. On arrival I parked and walking to the hospital entrance dodged horse chestnuts that were falling from the trees. Sam was asleep. He's now sleeping a lot. I think they may have upped the dose of his tranquilizers. There was a small incident the other night. He'd been flailing around violently and another patient restrained him. When he woke we chatted in his room. Well, mostly I talked and he said yes or no but I got the occasional few sensible sentences out of him - and a few more that were more difficult to make sense of. He was calm and friendly. I told him of the service user at the course the other day. One day in hospital she had an insight into her condition and determined to get herself better. I talked to Sam of this. At times he is aware of his condition and can make decisions that affect how well he is. He had been talking of the universe controlling his every action so I talked to him about wresting control back, about finding his real self, his ego and taking back control for himself. He seemed to understand a bit of what I was saying. I said I would keep challenging him in this way. It may do no good but I'm sure it can do little harm. I suggested we walked back to the canteen or the smoking room and Sam agreed. We met Sam's named nurse on the way. I took her to one side and asked if it might be possible to take Sam for a walk round the grounds. Surely that could do not harm. I was the one who took him back when he had escaped after all. She asked how he had been - she hadn't seen much of him today. I said he had been calm. If he hadn't been, I wouldn't have suggested it. She asked him if he was having any strange thoughts. I ask you - really, is this an appropriate assessment of whether he is fit to walk round the grounds with his dad???? "No, but I can if you want." It was the most rational thing he had said all afternoon. She said she would think about it while Sam had a cigarette. We sat in the smoking room for a while then in the canteen. I decided to look for her. There was nobody in the office. I went again later. Another nurse was there. No idea where Sam's named nurse was. Maybe she was hiding from me. Perhaps she wasn't prepared to make the decision. She didn't want the responsibility. If she authorised him going off the ward and then he absconded it would be down to her. I didn't want to make an issue of it so I left. Our friend Zoe came to stay the night while her mum went out with friends. Zoe has Downs Syndrome. I sat and talked with Zoe for ages in the evening. I'd not been feeling well all day - drained and empty with no physical or emotional strength. Talking with Zoe helped me feel calm and centred. I went on a course today - about psychosis. It was designed for professionals but the presenter decided he wanted a balance of service users and carers as well. Late in the morning one session was presented by a serice user. A bright attractive young woman described how at university she had begun hearing voices. Having made the mistake of telling people about them she soon found herself being sectioned. Going into hospital she felt was the start of her getting really poorly. The environment, the way she was treated and the medication were the cause of her getting worse. She was very strong and with support from professionals and family she managed to recover. She still has symptoms and is in control of them. She is now studying to be a clinical psychologist. I do wish her well. She talked about her mother being there for her and offering her daily support that helped give her the strength to go on. It was probalby then that I nearly started to cry. It was good to see someone who had recoverred from schizophrenia and was doing so well. It helped to give me some hope again. In the afternoon we talked about "hope". That was hard too. I probably spoke far too much. There is a UK television programme about a family with a son diagnosed with schizophrenia on tonight. It is called This Is My Family: Loving Christian and is on BBC2 at 9.00. You might like to watch. It features Georgina Wakefield, her husband Paul and their son Christian. Georgina first contacted me some time ago having found this weblog and we have exchanged a few emails and telephone conversations since. It's brave of her to do this but I hope it might help show to others the realities behind living with schizophrenia. She has already published books about her families experiences and I think I have written a little about them earlier in this journal. "Sometimes harrowing, sometimes touching, Loving Christian is a brave attempt at persuading viewers to overcome the prejudices they may have about this debilitating form of mental illness." Jane phoned the day following the ward round yesterday. So what decisions did they come to? Look - it's not a difficult question. The consultant psychiatrist is in charge. What do they always do when there is a problem? That's it - you've got it! They prescribe some more medication. Not another anti-psychotic thank heavens but an anti-depressant. I forget which but it's probably just as dangerous and addictive as the rest of them. It ends with the same suffix anyway. Today Jane decided to visit again - I think she was so worried after the last time she saw him. I kind of felt guilty. We don't have "turns". - But it was my turn. I haven't seen Sam for a while. It's kind of a relief really. I've been so upset on occasions recently when we have discussed Sam. Jane went with a friend, Ann. Ann has known Sam since he was born. Her son Matt was born around the same time and they've been lifelong friends. Though Matt hasn't been in touch much. Like all of Sam's friends - they don't know how to relate to him. So they drift away. It was good for Jane to have a friend with her. Ann was shocked. Both by the state of Sam and by the hospital. She knew it wasn't right for Sam. Sam, if anything, was even more poorly than a few days ago when Jane saw him last. He couldn't hold any kind of conversation and most sentences made little sense. "Do you know mum, I think I've got an underlying depression. And I think it started when I first went into mental hospital. You see it was so crazy there it affected my mind." When Jane tried to ask him more about this he started talking about a special pill he was going to invent that would enable people to hear music inside them. That brief interlude of lucidity had gone. But it might be quite important. Has hospitalisation been a contributing fact to his illness? Jane tried to talk with his named nurse about everything but just got angry and upset. Well look - if when you asked what the current plan was you were told it was to monitor Sam, and when you asked for how long you were told for a month or two, wouldn't you be angry and upset? If he was taking no medication he could not be more poorly than he is now. His named nurse is clearly worried about him. She described him climbing over the furniture, literally up and along the walls. She spent a quarter of an hour with him this morning but he wouldn't say a word - just looked anxiously around the room. Jane tried to explain she wasn't having a go at her, that she didn't have power but it must be hard for the nurse to soak this up without taking it personally. When Jane got home and told me about today - I wanted to write to the consultant and request a second opinion. We've already talked with the Maudsley help line about the medication and they have said the combination of drugs is not normal or recommended. We're going away next week so maybe we should leave it until our return. I don't know. Jane is coming to the conclusion that where Sam is now is not the best place for him. But we don't have any alternatives to suggest. Other hospitals could be just out of the frying pan and into the fire. Jane did manage though to get in touch with our care coordinator. As always, he was very supportive. We hope he might take up some of these issues for us. He is a fighter too. Jane went to see Sam yesterday. She knew it could be difficult. Staff had told her on the phone that he was not well enough to go out with her. He hadn't slept for several days. All night he was going to staff every few minutes for another cigarette. He thought he was being poisoned, that staff blood was in his cigarettes, he had two brains fighting each other. It was distressing for Jane to see him continuing to get more poorly. A nurse spent a little time with Jane later. She was kind and Jane was upset. On the way back Jane stopped for some "retail therapy". It always works!!! But only so far. This morning Jane phoned the ward again. It's clear the staff are worried about him too. Although his medication is changing he should be getting better now not becoming as poorly as this. The consultant will see him at ward round on Monday. Jane rang up the ward today to see how Sam was and to check on his medication. We know he hasn't been at all well recently and are putting it down to changes in his medication. The nurse said that Sam is looks worried, haunted. He has been going up to people and asking them if they want to fight. That isn't like Sam at all. Jane rang the Maudsley helpline to talk about the medication issues. We feel that using quetiapine alongside aripiprazole could be counterproductive. The pharmacist at the Maudsley kind of agreed. He was pessimistic though about finding a medical solution to Sam's problems. Having tried two antipsychotics and the effects of them wearing off and being unsuited to Clozapine he didn't hold out much hope. He even mentioned ECT which frightened us. It left us depressed and upset. It just confirmed what we were already feeling. So we treated ourselves to lunch out. We had a short walk first in the hills being blown by the winds. Then on to a nice country pub. The next stage though must be to begin to investigate other approaches. A friend who had been at the course in Manchester recently was talking of all sorts of approaches being used successfully elsewhere in Europe. We want to find out more.